Better than a catheter. Better than a catheter. 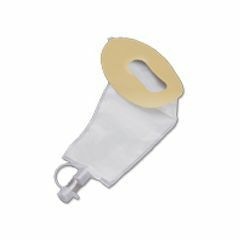 This is a better option for a catheter if you can use it. The key is to make sure the skin is clean and dry (including any residue from wipes) before attempting to stick it in place. Able to contain. Looks easy. Looks safe. Small children use. Skin breakdown unsafe. Trying to help. Sibling - caregiver. Regular cathathers were not working and patient was up to the largest cathather ever administered, and still a lot of leakage. My thought would be to try these for about ten days to help with other problems that are caused by urine leakage, but doctor said area had to much broke down on the skin to use on patient. **It would have probably worked otherwise. The doctor mentioned that this would have worked on people who do not have pubic hairs such as small bed ridden children. These would be great if it was the right situation. Suggested and used by our home health care nurse for our adult daughter who can no longer use an insertable cathetar. This has made a HUGE difference in our lives. Less laundry, less odor, less turning of the patient. Usually lasts 3-4 days. I'm so thankful these are available.